Wild Sally Road: Bead Soup in ON! First, here's a link to Lori Anderson's link for all the 360+ blog hoppers! Have fun but don't forget to stop and eat meals and sleep at night!!! 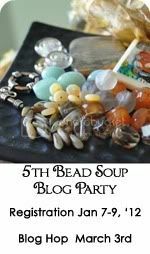 Bead Soup Blog Party headquarters! I really struggled with all this because I'm more of a bead weaver than a stringer. And the times I've done stringing have made me know that the people who do it well, (like our generous and outstandingly talented hostess, Lori Anderson at Pretty Things), are supremely talented in ways that I couldn't hope to approach. My friends are telling me I need more confidence but I don't think that's it. I'm usually not an unconfident person. I think what I really need is more experience and probably more education. I should take some classes! I should do more of the stringing! But when I sit down to bead, it's the delicas & seeds that call my name and the umteen boxes of seed beady goodness. That's where my heart is and maybe that's because I'm not so good at the stringing. I'm dunno! In the interest of fully revealing what happened to me on the way to this party, I will tell that I made a really, really ugly necklace! Oh my, it was bad. But I'll spare you from having to look at the disaster (and myself the humiliation) and just say that it was the Ugliest Necklace Ever. So after looking at for a couple of days, it was back to the drawing board. 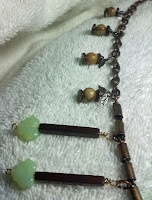 I ended up with a fairly long necklace using soup from both of my partners, a bracelet & a pair of earrings. Kelly's focal, a pendant from Kylie Parry is the focal I went with. I love the one from Candice, too, but it will have to be in a future work. In the end, I decided to forgo any clasp. The necklace is long and chunky and doesn't need one. I hope that doesn't break the rules too much! 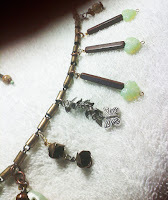 I started with the unusual chain that I won in a giveway from the lovely Cindy Wimmer at Sweet Bead Studio. It just seemed to go with the rustic feel that the soup was giving me. 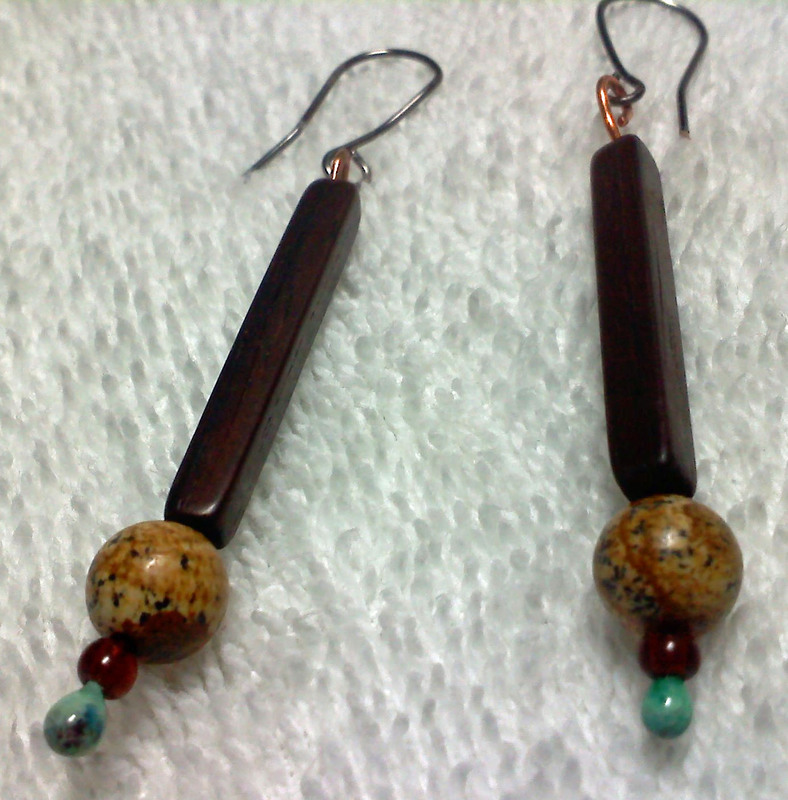 Those long wooden beads made me think of branches on trees so it was seemed only natural to add a leaf on each one. I like that okay. I'm not crazy about the silver leaf chain w/ the butterflies but it just has to stay there b/c I couldn't figure out what else to put there. The little antiqued brass flowers were also in Cindy's giveaway. I liked the way they went with all the chains. Included in my soup were the blue beads & sparkly crystals. So it seemed that the sky & clouds should go with with the foresty, earthy necklace and earrings. 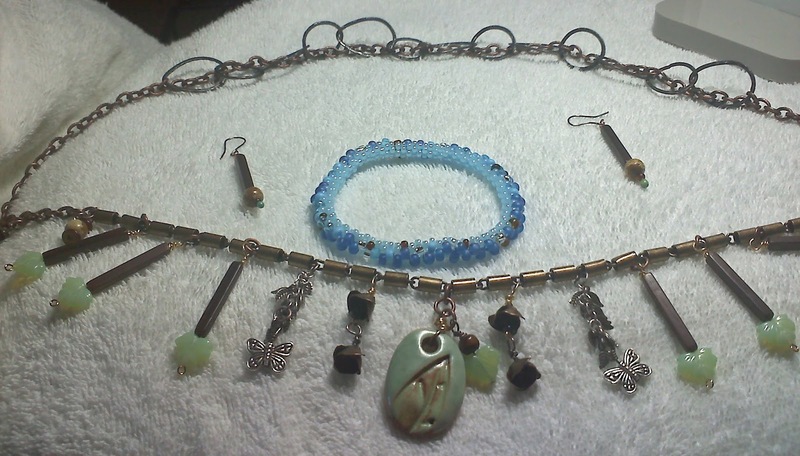 I added my own light blue beads and made the blue bangle which I love and which went really quickly. I'm sure you'll be seeing more bangles! It certainly was true that this experience stretched me (to the breaking point a couple of times) and, best of all, I learned a lot from the whole thing. Now go on to the next person on the list. You'll get through them all before Halloween, I'm pretty sure. Ok, before Thanksgiving then. Go. What are you waiting for? GO! Sally, I am so amazed at the way you combined both of you soups. When I was looking at them in the beginning I was not sure how you would do it but the whole set you made is amazing. I may end up leaving two comments sorry about that. Your necklace, bracelet (such a great way to bring in blues), and earings are beautiful. I really like the way you combined the two soups. What a way to push yourself out of your comfort zone with the strining! I love the way you incorporated pieces from both soups to create a wonderful necklace. Love the blue bracelet and awesome job on the earrings! Sally, knowing your earlier work, I can definitely see how you stretched yourself with this challenge. So many people think stringing is easy, but it's not. Sally my friend, you did it! So, maybe you just need to make more ugly necklaces to push yourself, cause this is a beautiful necklace! Kudos for all those dangles! Of course I love the blue bracelet, and the earrings just complete everything. Be very proud of yourself!!! I think you did a very nice job with your stringing. It turned out really well. And the earrings are so cute. Congrats. I think the necklace turned out fantastic! I love that you pushed yourself so hard and shared that experience with us. Beautiful dangles, loving your pieces. Great job of combining the parts and pieces from two soup-er blog partners. We’re all being pushed outside our comfort zones — with amazing results! I knew you would rock this and you so did! I love that you used both soups and I still want to see the pic of what you have called the ugly necklace! I'm so glad you stretched yourself and you felt free to take things apart and start over! 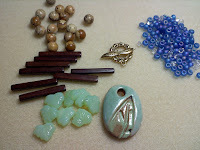 (and next time you don't have to use every bead and can maybe relax a little? :-)) I'm very impressed with what you made, the dangles, the chain choice, all the things you did for someone who professes they don't string! I hope you’ll participate again! Very different and very nice. Combining both the soup mixes worked really well. I sooo am not a stringer either and so far both bead soups I've been able to mostly not string! I know, I know, but I really did go out of my comfort zone! As I think you did too! Love your work! I love the necklace Sally, I adore dangles. I would wear this all the time! 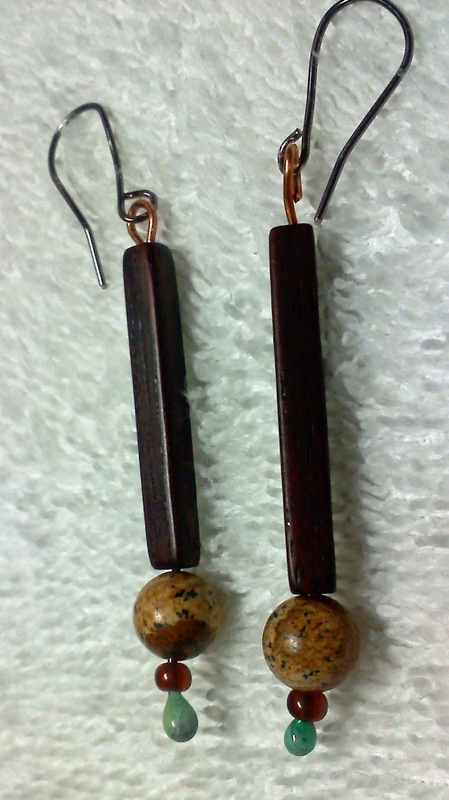 Those long wooden beads make a great statement. Keep on trying because you are doing wonderfully well. I really love those dangles! Beautiful creations! You did a nice job on the necklace and I LOVE the bangle! Great job with the stringing! Good on you for rising to the challenge.. ..personally I thought you did a great job and amazing to combine 2 soups ( I think I would fall apart if I had to use seed beads!!) .Love your blue bracelet too..I am sure that was a lot of work! You cooked up some loveliness - and I'm sure lots of people created some ugly along the way (I know I had to undo and redo one of my pieces several times before it worked!). Nice job, especially since you were combining two batches of soup mix! Great job Sally, I really like what you have done with your mixes, very, very pretty. I really like the earrings they are just my style! Great combining of soups, love you pieces! Hi Sally! I'm a few days late but I'm finally starting the "HOP"... and you're my first stop of course! I really like that you combined the 2 soups. I'm getting kind of a woodland warrior princess vibe from the necklace. I love the long wooden beads with the jade leaves. Also, congrats on making your first earring wires! That's exciting! I had fun being partners with you. Thank you for the kind words on my necklace. Time to check out the rest of the blogs! Great job, love that first necklace! Somehow I missed the story of how you ended up with TWO bead soup partners. In any case, that fact that you were able to combine two different soups into one necklace is pretty impressive. Well done, my friend! Well, for not being a bead stringer you sure ended up with a great necklace! Good for you!! I totally understand your feelings except in reverse. I don't have the seed bead talent. At least not yet! Hats off to you I say! Oh you rulebreaker, you! You did a fabulous job with your beads!! Great designs - all so pretty! Great movement in your Bead soup Reveal! I like you stuff. Very nice, it will be fun to wear. From the sounds of it you REALLY pushed yourself outside your comfort zone and you did a great job with it. i'm sure the first necklace wasn't as bad as you thought. you have a keen sense of design it seems and the rest will just come with practice. There's nothing wrong with sticking with seed bead weaving. I wouldn't begin to attempt any of that! Kudos to you! What a cool design your necklace is. I love the "branches" with their leaves. You've done a great job working with the long wooden beads. What a creative use of your soup! They all came out so lovely. I like what you made out of our soups and it is neat that they could both work together like that. The chain is cool- that was a great idea. I really have to say I like the earrings alot too. I wish I was brave enough to try my own earwires and glad also(don't mean it in a mean way) I am glad I was not the only one who had problems. I was afraid I might break something myself. This was a great test for you and I love how you strung up everything! The earrings are amazing! Nice work! Like you I prefer bead weaving, but you did a fantastic job with your stringing piece! Really great job! Good to do something hard sometimes, huh? Wow, tackling two soups at once and combining them! Kudos for not letting it intimidate you too much! Oh and I LOVE the earrings :) So nice! Combining two different soups into one amazing piece is fantastic! What a challenge, great job! Wow, you were really busy! You've done some beautiful work. Lovely to see your soup! Nice job! Very nice! You did a great job with both of your soups! Such wonderful work! I love how many things you were able to make with your soup! 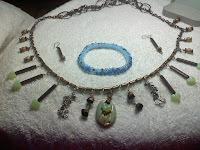 Love the organic earthiness of the necklace and earrings...the bangle is just blu-ti-ful. Soup-er job! Very nice work, I really love those little earrings!! The sprinkle of color with the long black tube beads is perfect!! Lovely soup! Two??? You must like challenges :) Love the danglies from the chain! Lovely work and ingenious the way you combined the two soups. I like the necklace especially and would definitely wear something like that myself. The vibe is so rustic and calm and woodsy. Well done! Great idea combining your soups. They came together nicely in the necklace. Love the bracelet, too! Lovely necklace! I really like the colours and the balance between all the dangles. That chain looks great in the design (at first I thought it was linked short bugle beads). The bracelet is very cute too. Great job! love the bangle! so fun. Beautiful collection! I would love to see how the necklace looks when worn-it is really fun. I love the earrings, very contemporary! Nice work! 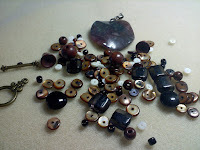 Sally, I loved reading your post about your adventure with the bead soup! I think working outside my comfort zone really pushes my creativity. I grumbled a lot but it's soo good for me! You did wonderful creations with your soup and with pushing your boundaries! Pat yourself on your back! I don't know if you had time to watch my new video while you were at my blog? 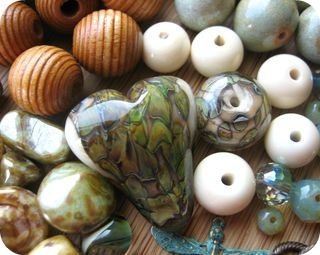 I'm not sure if you are familiar with glass lampwork but my video explains what glass lampwork beads are. Would love for you to check it out and help me share it with others if you enjoyed it. Working on getting the word out about glass lampworking.